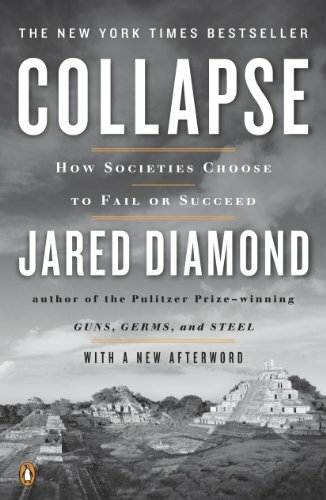 Coming on strong after the success of his Pulitzer Prize-winning Guns, Germs, and Steel, Jared Diamond’s new book, Collapse: How Societies Choose to Fail or Succeed is a tome of intriguing insight to the other side of the coin. While Guns, Germs and Steel examined how some societies thrived, due to their respective geographic and environmental endowments, this book examines why ancient societies have collapsed so often in the past, in part for the same reasons. To support this thesis, the book delves into a variety of past civilizations, including the Anasazi of the American Southwest, the Maya and the Viking colonies of Greenland to illustrate that collapse of a society are no respecter of geography, nor is it a respecter of time. Collapse: How Societies Choose to Fail or Succeed also looks at modern-day societies such as Rwanda to explain the catastrophe that recently befell this afflicted nation, as well as it depicts present-day Montana and the fascinating factors rendering this once wealthy state into one of the poorest. Could Montana be a microcosm for the U.S. at large? The book asks how once astute societies that built magnificent monuments testifying of their social and economic prowess, could suddenly vanish or be rendered impotent. Not lost on the reader throughout these case studies is the nagging thought that perhaps this fate might also befall our own wealthy country. In fact, it is the seminal point of this provocative book. Collapse: How Societies Choose to Fail or Succeed hopes to stir our collective consciousness to an understanding what lies before us so that we may be saved, as evidenced, from the pitfalls of the past. In essence, we cannot separate the economy from the environment if we hope to avoid devastation. Perhaps this is best depicted in the book’s treatise of the Anasazi. Their vast ruins in what is now northern New Mexico echo a well-ordered, sophisticated society in a fragile desert environment that lasted over 600 years. To put this into perspective, they lasted longer than any European society in the Americas to date. However, over time the Anasazi of the Chaco Canyon complex became ever more specialized in the tasks of the society. This in turn allowed them to make gains in economies of efficiency while establishing them equally interdependent as a culture. More and more the main complex at Chaco Canyon depended on outlying communities and outposts for their support, not unlike London or Rome today. These cities served as governmental and religious centers to facilitate the management their respective societies. Collapse: How Societies Choose to Fail or Succeed describes how, like many of our cities of today, “Chaco Canyon became a black hole into which goods were imported but from which nothing tangible was exported.” As the population grew so did the demands on the surrounding environment. Fuel and other essential resources became ever more distant; coupled with soil depletion and erosion in the bordering farmlands. In essence, they became increasingly close to living on the margin of what the environment could reasonably support. The final straw was a prolonged drought. No longer able to support or feed themselves, the society suddenly collapsed into open revolt and total civil warfare, culminating in cannibalism and ultimately total abandonment of the site. The moral lesson is that while they “adopted solutions that were brilliantly successful and understandable in the ‘short term’ (they) created fatal problems in the long run.” The analogy to our present-day situation of overextending ourselves is obvious. While Collapse: How Societies Choose to Fail or Succeed seems to make a strong connection between a collapse of a society and its environment, this book is not all about eco-meltdowns. He also measures four other critical factors involving the demise of societies as well, including hostile neighbors, loss of trading partners; climate change and perhaps most importantly, a society’s responses to its challenges. In this vein, this book also looks at several past success stories where societies in Japan, and the highlands of New Guinea had the insight to change fundamental, traditional values and restore a positive balance with nature, trading partners, etc. and thrive. In its conclusion, Collapse: How Societies Choose to Fail or Succeed presents a cautious optimism for our own future. The book concludes that because we are the creators our particular problems, we also have the power to amend the quandaries we have made. This, the book maintains, will not be easy and will require profound courage; however, necessary if we are to have hope for the future.